Liz's Paper Loft: "Pre-sneak party" blog hop! Welcome to our very first "Pre-sneak party" blog hop at My Creative Time! You should have arrived here from the fabulous Miss Leanne, if not head over to Miss Emma's for the start! Since this is a bigger release than usual, we want to share as much as we can before our sneaks starting on Monday, April 15th along with our HUGE release on Friday, April 19th @ 8am. Now I've been telling you for the past few weeks how life has been keeping me busy and haven't been able to craft as much as I'd like. Well, now I have one more thing that's happened...my daughter is engaged! (this will get me back in my craft room for sure!) We are so excited for her and her fiancé...we are truly blessed! I'm not sure if you noticed or not, but we decided NOT to state the products each of us used on our projects today! The reason for this is because we wanted to play a game w/all of YOU! Yep, we want YOU to guess what is the new "item" we are using today! Leave your answer in the comments in this post for a chance to win one of the new releases! All stamps are from My Creative Time! Whoo Hoo!!! congrats to you and the family Liz!!! How super exciting!!! 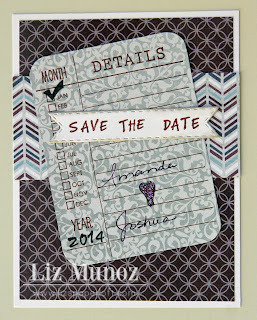 Well I just think this "save the date" card is awesome with the new sentiment stamps and calendar stamps! I just LOVE how you put this together!!!! Love this, Liz! I'm so happy for Amanda and you guys!!! Love this save the date card!!! Save the date stamp? 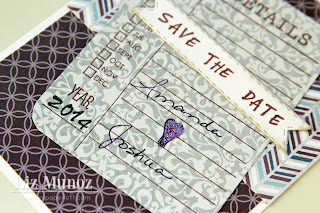 I love the save the date stamps! Great save the date!!! I believe the library card die is new. What a great to send out Save The Date notices! This is really cute. Great job as always, Liz! Gorgeous card! Guesses: note/library card die, with various background stamps (library card, date card...), sentiments. library card and month stamps. Library card die cut and coordinating stamp. So cute! Such a cute idea! The die and stamp are new. so cute! I'm thinking its a library card and stamp to go w/it! Really cute!! The library card and sentiment are new. what a cute save the date card!! so, the stamps are new with all the months and boxes and sentiments and the new page die and the check die!! can't wait til Friday! OMG I love this Liz! Your projects belong in a magazine!!! Great job! Cute Card Liz, love the colors, new library card die and sentiment. What an awesome idea. you are brilliant. My guess is the library card. Very cute postcard, love the colors you used, too. My guess is the card die and the stamp is new. Thanks for sharing! This is beautiful!! Congrats to them! Loving the new details stamp!! I believe the stamp used is new on this one! LOVE the stamps on the new journaling card die!!! Eek!!!! Great idea for a card!! Love it!! The new card die and stamp on it. Wow Liz, congrats to you and your daughter - how fun!!! 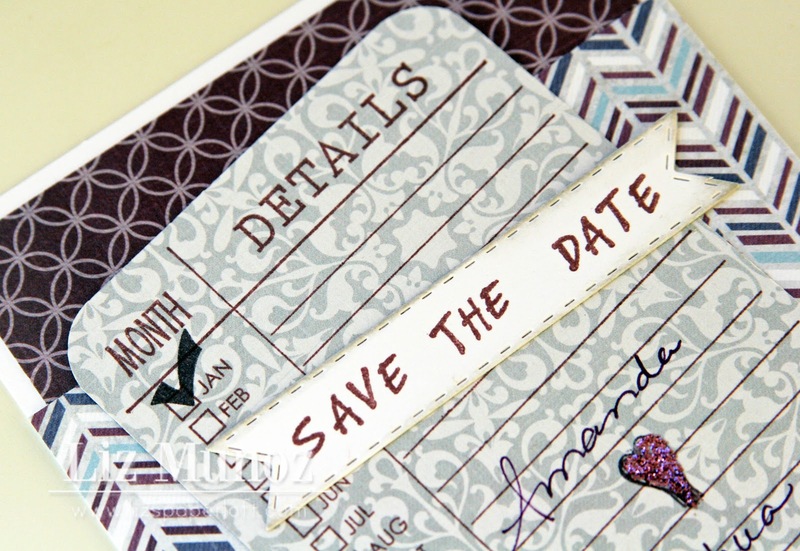 This is such an awesome save the date- it's beautiful, so many fun new products - lovin the stitched mat and the calendar stamp, I'm sure all the sentiments are going to be perfect! The journaling card stamp is new. Great card, I think the library card die and calendar stamp are new. Love the project! I would say it's the library card die and also new stamps. LOVE the library card...new sentiments! Love the card. The library card stamp and die I think are new. Beautiful! 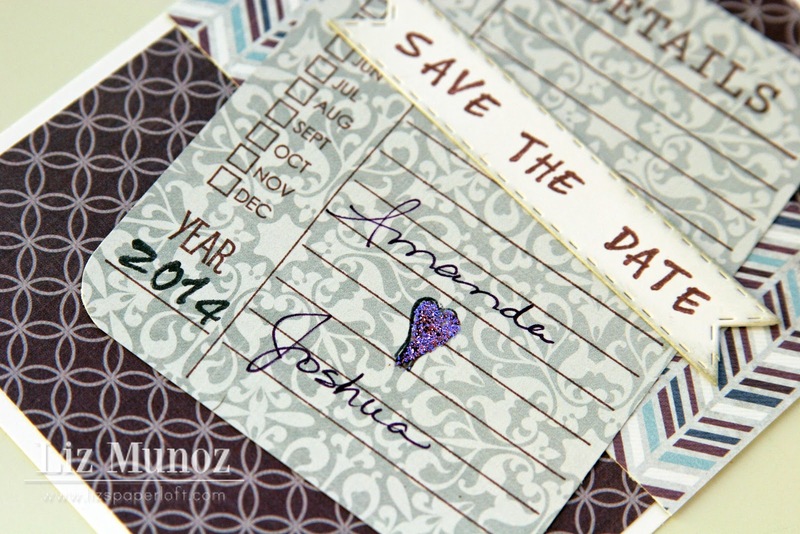 I am thinking the journal paper is a new die and so is the save the date sentiment. Congrats to you and your family! That is so exciting! Cant wait to see all the fun wedding stuff you will be making. Be sure to share with us! Liz, your save the date card is awesome! I love the fun design! I am thinking the sentiment calendar and sentiments are new. Library card and check die? Congratulations to you and your family on your daughter's engagement! Looks like the new library card stamp is really awesome way to announce your daugther's engagement. Love the idea. What a great card - congrats to you and your daughter. Could be the library card...could be....yeah, I think its the Library card. 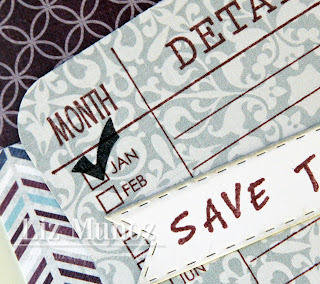 library stamp card--how very cute is your save the date!! Love the Library card the lightbulb and the Save the Date sentiment!!! I am guessing the rectangle with rounded corners is a die and the stamping on it is a new stamp. Great card and congratulations to your Daughter! This a wonderful card! TFS. I'm going to say the date card with the stamping. How exciting! Congrats to everyone!! My guess is the date stamp. Congrats to your daughter and soon-to-be SIL - the longest walk she'll ever take is down that aisle. Background and cordinating stamps (Library set),thats my guess! Congrats on gaining a son in-law! Adorable save the date!! I'm hoping the card and coordinating stamps are in the new release!! Lovely! I really love this library/journaling tags! love the library cards, will be so great for journalling. Is it the library card and detail stamp? I like it!!!! New items are the cute library card and sentiment. Great card! OMG! I adore your postcard! Congratulations...how exciting! Your daughter will love this save the date postcard....it's so beautiful! Now, as for the new item that you used for your project...I thinks it's a 3x4 die and stamps to go with it. Thank you for sharing! Have a wonderful day! Cute, cute card Liz!! I think the "details" stamp is new! Details card and the Save the Date! So cute! seems like there's another one and I can't think of it. my guess the library card and save the date stamp. Library card with the stamp set on it. Save the date is not new! Love the plum and grey with blues. Many blessings to you all as you move toward this celebration of love. My guess is the rounded rectangle die and new stamps. 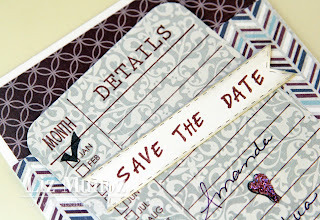 Library card die and a new Monthly invitation/meeting to do event stamp set... Love it! Liz ~ Oh what a great way to use the BLANK and the BLANK! Hehehehe! You know how hard this is for me not to say anything! I think the papers are so PERFECT together! Can't wait for this week to get started!